You’re finally ready to take control of your health and become body positive, whatever that means to you. That first day in the gym isn’t as easy as you pictured it though; you might be there with all of those apps that claim to be “trainers” on your phone but they feed you recycled quotes and generic exercises. Meanwhile, you look to your left and there’s the person you wish you looked and trained like. The one who’s doing what you wish you could. All you want to do is go up to them and ask them two simple questions. Let’s be honest – those options sound far from ideal. I know this for a fact because I’ve been there. This is why we created fittcoach. It’s a chance for everyone to get trained by the ones who truly know what they’re doing and have a passion for it; by those same people you look up to in the gym, at your yoga class, in a boxing ring, or on the track. 1. Just like Uber and AirBnB, the people providing you fitness services are everyday folks like you. Our fittcoaches range from working mothers/fathers to university students, from investment bankers and doctors to independent artists and personal chefs. They all come from a different background, share a different story but have one thing in common: they live and breathe fitness - whether that’s boxing, powerlifting, marathon running, or bodybuilding. We want you to get trained by someone who shares your story and knows what you’re going through. We handpick every trainer that comes on as a fittcoach. We interview them thoroughly to find out why they want to train others, what kind of experience they have, and what kind of advice and expertise can they pass on to their clients. 3. You are not obliged to stick with one fittcoach. Choose someone who shares your story. Let’s say you want to try CrossFit one day and need a trainer to show you the ropes. With a gym appointed trainer, you could be locked into a fitness program before you know it’s right for you. With fittcoach, after you have your lesson you can schedule another or switch to something else. Your options for when and how you want to be trained are completely up to you. 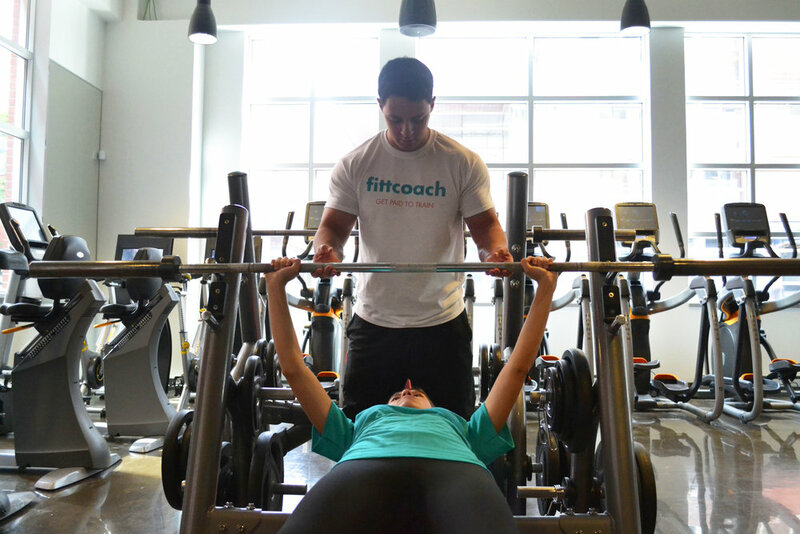 Personalized training services from people who love what they do…that’s fittcoach. We started fittcoach for one simple reason: to deliver high quality personal training services that everyone can afford. Whether you’re looking to find a fittcoach to help you get in the shape of your life or you want to become a fittcoach and help others achieve their fitness goal, download our app and get started!